Ba Be Lake, the most important part of Ba Be National Park which forms the unique natural beauty in this area has just become the 1,938th Ramsar of the world and the third Ramsar of Vietnam following Xuan Thuy National Park in Nam Dinh Province and Cat Tien National Park in Dong Nai Province. 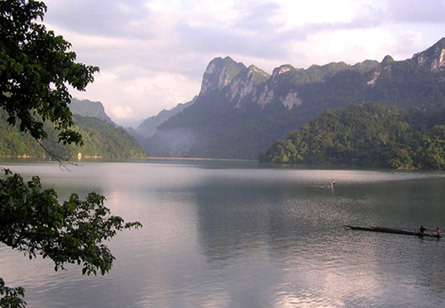 Located in Bac Kan province, about 300km from Hanoi capital, Ba Be lake is a highlight of northwest forest of Vietnam. Surrounding by limestone hills of up to 500-600 m above sea level, the lake consists of three parts, Pe leng, Pe lu and Pe lam of which the total length is 9 km, the width changes between 0.2 km and 1.7km and the average depth varies from 17 to 23 m (maximum depth reaching 38 m). The Ba Be Lake is connected with the Nang River by Be Cam Channel, to which the water drains during the dry season. The lake thus serves as a natural reservoir for the Nang River system, while the Dau Dang Waterfall plays a role of dam for the lake. The lake has an abundant ecosystem and also home to many types of water birds. In addition, surveys affirm the unique biodiversity of Ba Be National Park with 1,288 types of vascular plants. Noticeably, it supports a number of globally threatened species such as the endangered burretiodendron hsienmu (a species of flowering plant in the Tiliaceae family) which is considered as an endemic plant in Ba Be Lake and has a habitat restricted to Vietnam and southern China. In terms of animals, the site includes 553 types of vertebrates with 81 beasts, 332 birds, 48 amphibians and 106 fishes. Many of which are listed on the International Union for Conservation of Nature (IUCN) Red Book on endangered species such as the lutra lutra, miniopterus schrebersii, belomys pearsonii, trachypithecus francoisi, hemigalus owstoni and gorsachius magnificus. With the values endowed by the nature, Ba Be Lake was recognized as one of 68 most important wetlands of high national and international environmental value. This recognition will advertise Ba Be National Park and Bac Kan Province to international tourists, has become a national pride. The potential for outdoor activities is great for adventure tours including trekking and river kayaking tours. The surrounding area make it a good place for trekking tours and exploring culture of Dzao and H’mong ethnic minorities who live in the national park. And the lake seems to be a heaven for kayaking. Ba Be lake is really a great destination for those who love adventure and want to explore natural beauty.